Welcome to Riu Palace Tropical Bay, Negril, Jamaica! The Riu Palace Tropical Bay resort is nestled in the major Western Jamaica tourist area of Negril and is highly popular among couples, families, or friends looking for a good time in Reggae land. Many people love a Jamaican vacation and travel from far to visit the exciting Riu Palace Tropical Bay Inclusive Resort - one of several top inclusive vacation resorts in Negril. The greatest thing about visiting any vacation spot in Jamaica is that the weather is pretty warm all year round. You can visit at anytime of the year. What is the Weather Like in Negril, Jamaica? Like most places in the Caribbean in general and in Jamaica in particular, the weather in Negril is great all year round. Consequently, visitors frequent the area at anytime during the year. There is no bad time to visit Negril. During the hottest months of July and August, the highest temperatures remain in the 90's. And during the "coldest" months of January through March, the highest temperatures remain above 80 degrees. The temperatures at nights sometimes reach into the 60's during "winter". Some months during the Atlantic Hurricane Season, June to November, tend to be a mixture of some rain and lots of sun in between. Prices tend to be better during the latter part of the hurricane season. 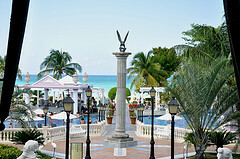 Riu Palace Tropical Bay All Inclusive is located on the beach in Negril, close to Kool Runnings Water Park. Other points of interest are Seven Mile Beach and Negril Hills Golf Club. Property Features: This property is all inclusive. Rates include meals and beverages at on site dining establishments, taxes, and gratuities. Riu Palace Tropical Bay All Inclusive features a restaurant, a poolside bar, a bar/lounge, and a swim up bar. Recreational Amenities include an outdoor pool, a children's pool, a spa tub, a sauna, and a fitness facility. The property's full service health spa has beauty services. Wedding services and tour assistance are available. Guestrooms: There are 416 guestrooms at Riu Palace Tropical Bay All Inclusive. Bathrooms feature separate bathtubs and showers, complimentary toiletries, and hair dryers. Guestrooms offer in room safes (accommodate laptops). Plasma televisions are available in guestrooms. Air conditioned rooms also include separate sitting areas, complimentary bottled water, ceiling fans, and blackout drapes/curtains. Guests may request irons/ironing boards and wake up calls. The Donald Sangster's International Airport in Montego Bay is the nearest airport to Negril. This is the airport most travelers to Jamaica choose when visiting the Riu Palace Tropical Bay Inclusive Resort. Several international airlines visit the Montego Bay International Airport daily and so it should be easy to find a flight into that airport. How do you get from the Montego Bay Airport to the Riu Palace Tropical Bay? 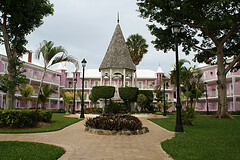 The Riu Palace Tropical Bay is about 1 1/2 hours from the airport. Generally, if you book an inclusive package (flight and resort), you will be offered complimentary transfers or you may select a transfer type at a cost - shared shuttle or private transfer from the airport to the Riu Palace Tropical Bay Inclusive Resort. If not, you will need to arrange for transfer. There are several companies offering transfers from the Montego Airport to Negril hotels. While it is safer to use the airport's shuttle/taxi service, it will be less costly to use another service. 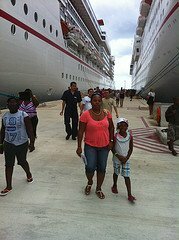 Past guests have recommended Jamaica Tours, JUTA Tours, Tropical Tours, Talk of the Town Tours and others. You may reserve some shuttle services online, or wait until you get off the airplane to book one. Expect to pay about $20 or more per person one way. If you buy a roundtrip, it will cost less. 1. 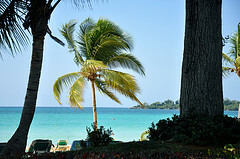 Couples Negril: Find the best deal, compare prices, and read what other travelers have to say. 2. Beaches Negril: Find the best deal, compare prices, and read what other travelers have to say. 3. Sandals Negril Beach Resort & Spa: Find the best deal, compare prices, and read what other travelers have to say. 4. ClubHotel Riu Negril: Find the best deal, compare prices, and read what other travelers have to say. 5. Hedonish II: Find the best deal, compare prices, and read what other travelers have to say. Didn't find what you were looking for? Use the TripAdvisor Search Box below to continue your search for other inclusive resorts in Negril, Jamaica. I believe that you and your family will have lots of fun at your chosen all-inclusive resort in Negril, Jamaica. When you return, please share with us your experience at the Riu Palace Tropical Bay Resort.